TS NTSE/National Talent Search Exam 2017 Instructions to submit NRs, Challan Forms. TS Treasury Branches for TS NTSE, DEO Instructions of NTSE November 2017, Challan form for remittance fee of NTSE, Press Note of NTSE Exam. Govt Of Telangana, Rc.No.02, dated:06-09-2017:: Sub:- Conduct of National Talent Search Examination November 2017 (First Level) - Instructions to submit printed Nominal Rolls, Challans etc., - Reg. Ref:- This office press note on Rc.No.02/E2-1/2017, dt: OG-09-2017. I am to inform you that the National Talent Search Examination, November 2017 1st level examination) will be conducted on 05-11-2017 from 10.00 AM to 01.00 PM in all District Head Quarters in the State. All the regular students who are studying Class X during Academic year 2017-18 in all recognized schools including Central Government schools are eligible to write the test. Applications of the candidates should be registered online in this office web site "http//bse.telangana.gov.in" as explained in user guide. Off line applications are not accepted. The due dates for remittance of examination fee, registration of Applications online, submission of Print of online registered Application Forms, chalans and printed report(i.e.NR in duplicate)in the Office of District Educational Officers concerned by the Headmasters, and last date for submission of Nominal Rolls in the O/o. the Director of Government Examinations, TS, Hyderabad by the District Educational Officers' were already published vide Press Note cited (copy of the press note enclosed). Instructions to the District Educational Officers' and due dates may also be downloaded from this office website i.e., 'http//bse.telangana.gov.in'. Further, I am to inform you that the existing pattern of examination as was done in last year. If the fee is paid through consolidated Challan, the Headmaster should invariably write the names of the fee paid candidates on the reverse side of the Challan duly signed by the Headmaster concerned. 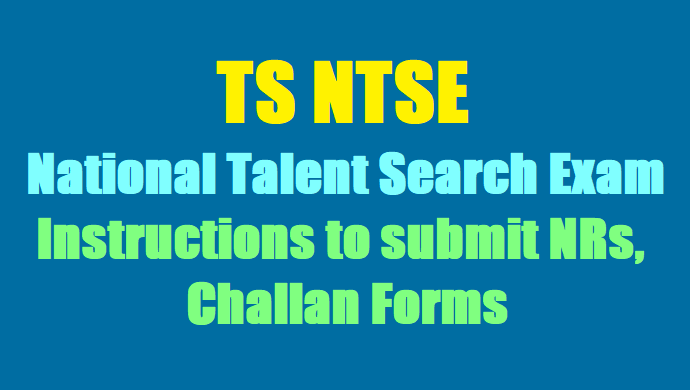 If the space is not sufficient, a separate paper may be used to write the names of candidates and it should be attached to the Challan without fail. Demand Drafts are not accepted. Further, I request you to inform all the Heads of recognized schools/Institutions under your jurisdiction (including Kendriya Vidyalayas, Navodaya Vidyalayas and schools affiliated to l.C.S.E. & C.B.S.E., New Delhi) about the examination, and give wide publicity regarding the Examination by issuing Press Note in all leading daily News Papers and Electronic Media. Also to inform the Headmasters, students studying X class through print and electronic media to visit this office website 'http//bse.telangana.gov.in' for the details in this regard. After recervmg printed applications after online registration, chalans and NRs from the Headmasters, in the first instance, verify (a) whether the school is recognized or not, (b) the certification and attestation of Head Master concerned, (c) Fee paid for all the candidates in time or not, (d) whether all the required documents are enclosed or not and then the registration of the candidates will be approved by verifying the data in the web site (to login separate admin will be issued to the DEOs). In the second instance, separate them as school code wise order. Keep printed applications, other relevant documents and one copy of Nominal Rolls with you for your future reference. One Hard copy of the Nominal Roll may be furnished to this office alongwith the Challans (see Annexure-I) and Copy of the caste/Disability certificate in respect of the SC/ST/PH candidates on or before the last date given in press note. Arrange all the items of one school in one bundle. Candidate should enclose a copy of his/her caste/Disability certificates in case of SC/ST/PH candidates duly attested by any Gazetted officer to avail the reservation facility, otherwise the candidate may be treated as General candidate. The candidates who are the beneficiaries of NMMS scholarships and who are studying X class during Academic year 2017-18 may also appear for NTSE Nov 2017, but such candidates have to forego the further NMMS scholarships invariably, if he/she selected in NTSE in the Test. Further, I request you to constitute required number of examination centres at the District Headquarters as per herewith enclosed annexure II basing on the number of candidates appearing for examination in district ignoring the educational zones of SSC examinations. Each District may constitute up to 99 (ninety nine) centres and each centre may accommodate up to 240 candidates. The District Educational Officer has to identify the Government/ ZP/Govt. Aided schools only for the Centres which are having sufficient furniture and accommodation for 240 candidates. Names of the Chief Superintendents and Departmental Officers appointed for the examination centres shall be informed to this office. Necessary funds will be allotted to you to meet the required expenditure towards the conduct of examinations. Necessary instructions for the conduct of examination will be issued well in advance.